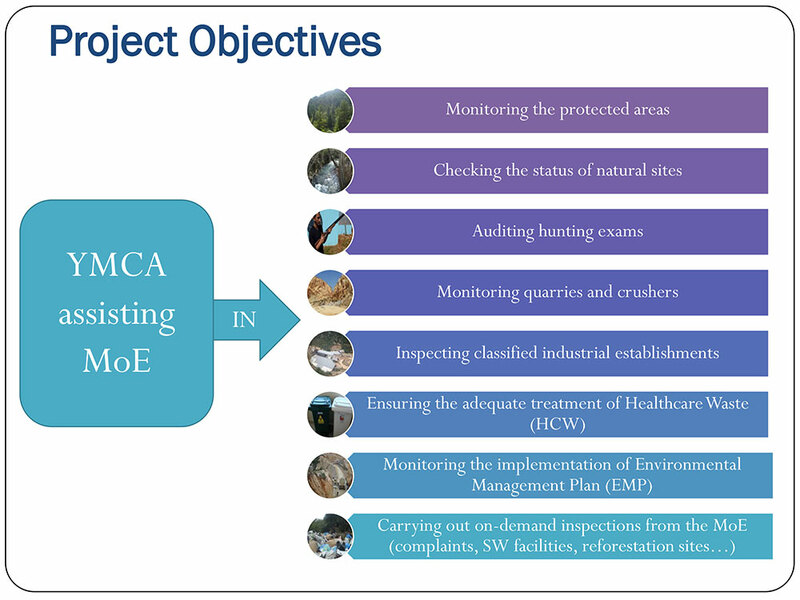 The project entitled “Environmental Watchdogs for Environmental Protection” is developed to assist the Ministry of Environment (MoE) in monitoring the protected areas and natural sites in Lebanon, in addition to controlling point source pollution through inspection visits to licensed quarries, industries, healthcare facilities and other developmental projects. The YMCA, in partnership with the Ministry of Environment (MoE), and the United Nations Development Program (UNDP), through the “Institutional Strengthening of the Ministry of Environment” project, is implementing the project. January 2014 – March 2015: Envolved to controlling point sources pollution through inspection visits to quarries & crushers, industries, healthcare facilities, & newly proposed development projects in addition to its previous responsibilities. Today, YMCA Lebanon is working hand in hand with the Ministry of Environment to address on-demand environmental complaints, including wastewater flooding, solid waste dumps, CDW dumps, generators, tree cutting, air pollution, farms, and cattle being raised among houses.